SG50 Baby Jubilee gift pack big reveal! In July, we shared about the list of 8 items in SG50 Baby Jubilee Gifts for Singaporeans born next year. The items were unveiled to all last Sunday! All of these items will come in a handy suitcase. Click on each item to see the item! Parents of Singaporean children born in 2015 will first need to register the birth of their child in order to receive the SG50 Baby Jubilee Gift. Thereafter, parents can opt for either complementary home delivery or self collection at birth registrations counters. 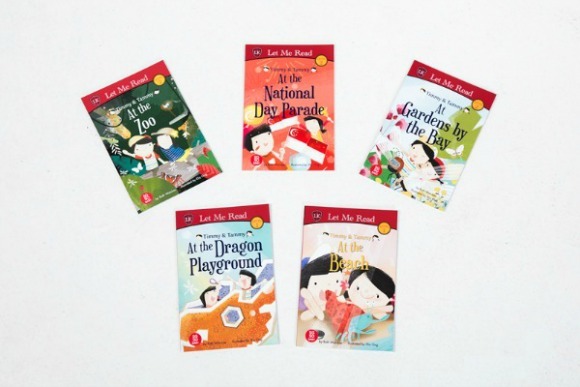 We especially like the set of baby books that focused on elements and places that are uniquely Singapore! Congrats to all parents who will be receiving this lovely welcome gift next year! Starting a yoga practice can be an intimidating thing for a beginner. But we know that anyone can do yoga, and everyone has to start somewhere. So, here are a few yoga tips for anyone looking to start a yoga practice. -Choose the right yoga for you. There are so many different types of yoga, if you don’t like one type, give another one a try! Iyengar, Yin, Hatha, Vinyasa, Bikram…the list goes on! There’s a yoga type for any type, so don’t be discouraged if it takes a few tries to find the perfect fit! -Don’t worry if you can’t touch your toes in the first class. Yoga is a gradual process of lengthening and strengthening muscles, if you can’t touch your toes now, no worries! You’ll definitely be able to as your practice develops. -Take things slowly and listen to your body. Even if the yogis next to you are flowing into amazing poses, listen to where your body wants to go. You’ll get there slowly, but surely! -Go for the experience, not an end goal. Try to enjoy the calming experience of yoga one class at a time. All that said, the best tip for any beginner yogi is: get started! Contact VandaYoga for more information about classes and yoga styles.